East Valley brewery, Arizona Wilderness Brewing Co., (AWBC) make a point to source ingredients from local farms for their menu and brew process. 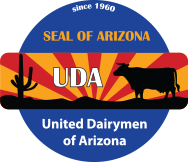 Recently, AWBC took a tour of Arizona Dairy Co. to get an up close look at dairy farming in Arizona. While there, the AWBC team filmed a video to feature UDA as their local lactose and cheese supplier. UDA is able to pull lactose out of milk as a by-product which is then used in many types of packaged foods and beverages, like AWBC beers! We love customers who support local agriculture!